Yesterday we played some games at a going away BBQ for Alex and Darnell. We each wrote a sentence on a separate page. Then we passed the papers and drew the sentence we read. Then we folded the papers so that only the drawings were showing. After passing, we had to write a description of the picture. This just continued until we got bored. Here are our results. Next we changed to a different game. We each took turns drawing a segment of a picture. We couldn’t look at the previous segment, but the lines would be extended down slightly so that the next person could see where their section connects. Confusing to describe, but you’d probably understand if you’d just scroll down and look! This entry was posted in Art, Journal, Photos and Screenshots, Table-Top Gaming and tagged alex on September 30, 2012 by TheUser. Following the weekend excitement of Temecula, I met up with Alex, Darnell, Devin, Lorena, Gracie, and John for dinner and drinks Monday night. Gracie and John had to leave, but I went back to Alex and Darnell’s room to stay the night and go to Disneyland the next day. The woman working the desk at the La Quinta, Erica, was super friendly and excited to see we were carrying in Apples to Apples. We enjoyed the game, and Devin did very well despite being half asleep. The next day we spent the morning in California Adventure. We went on the Ferris wheel, California Screamin’, and had lunch. Of course, we had to play Toy Story Mania too. I beat gem, but her animal was better. 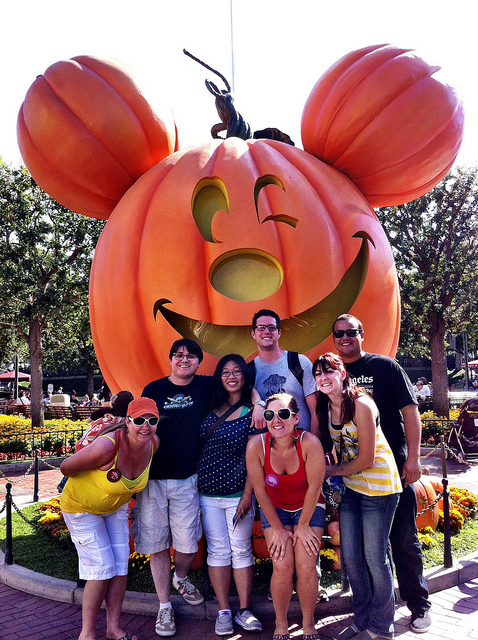 We met with Daniel and Mallory and headed into Disneyland. Lots of fun was had in Disneyland, including meeting ASIMO. While having a slow machine do simple tasks I could more easily do myself isn’t useful right now, it’s definitely cool technology. After Disneyland we had dinner at the House of Blues before returning to the hotel room to hang out a little. I was pretty worn out when I got home, but it was great fun. Now I just wait for the parties this weekend! 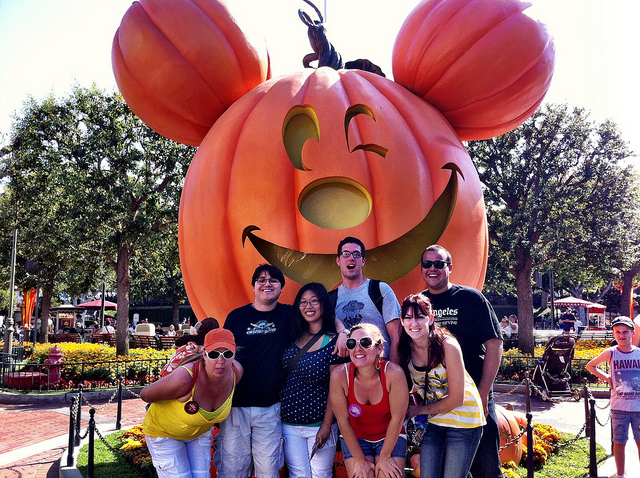 This entry was posted in Journal, Photos and Screenshots and tagged alex, disneyland on September 26, 2012 by TheUser. Because Alex and Darnell are back visiting in California, we went wine tasting in Temecula over the weekend. Here we’re at Leonesse Cellars, the first stop on our tour. We had a pretty full van – Alex, Darnell, Alex’s parents Hal and Mary Margaret, Darnell’s parents Devin and Lorena, Mike, gem, Gracie, our sober driver John, and myself. We got to try the grapes that were destined to become wine. They were tasty this way too but different than the grapes you’d buy in a grocery store to eat. Our guide took some time to explain the process itself and showed us the large tanks. Then we went inside for the actual tastings. I didn’t know anything really about wine, but our host spoke for a few minutes on each wine. It was a lot of fun. The Wilson Creek Winery was much more laid back. They also had a port served in a glass made of chocolate. It was interesting! We picked up a pizza to eat in the van on our way to the next winery. The Maruice Car’rie Winery had terrible service. Luckily it was photogenic! By the time we reached the Black Market Brewery, I had had enough to drink. I talked games with John before heading outside to chat with Mary Margaret. We had dinner at Public House, a pub with fun, live music. The plan was to eat appetizers and have drinks, but a few of us wanted real food. Hal got us a table at the restaurant so he, Mary Margaret, Alex, Mike, gem, and me had a nice dinner. I had some tasty chicken stuffed with peppers. In the evening, Mike, Alex, gem, and I had fun conversation in which we decided the van was its own nation, Vanica. It very quickly evolved into a corrupt state with a religious figure, John, used to keep the front passengers in line. Art imitates reality. A post like this doesn’t really do the trip justice. What was great was talking with friends. I miss Alex and Darnell, and it was wonderful to see them again. They have good taste in friends, so seeing our mutual friends is also fun, and they both have amazing families too. Edit: I forgot to add that those meanies made me dance at the Public House. Oh well. It wasn’t so bad! This entry was posted in Events, Journal, Photos and Screenshots and tagged alex, wine tasting on September 26, 2012 by TheUser. Nate’s going down this week. This entry was posted in Art, Sports and tagged fantasy football on September 16, 2012 by TheUser. Last week was my great-grandmother’s 90th birthday. We met at my mom’s house Saturday around 6:45 to drive to Vegas to surprise her. During the car ride I got to enjoy some Super Mario 3D Land and podcasts, which was fun. We visited with my grandparents for a bit before heading to the restaurant. Along with my aunt and uncle, their kids, my other uncle, and his daughter, we all hid and yelled surprise when Nana got there. She’s 90, but luckily she didn’t have a heart attack. After dinner we all went back to my grandparents’ house. There was a delicious looking white cake with strawberry filling, but I didn’t eat any. We talked for a bit, but there was a super loud football game on TV with a lot of yelling (because what’s not exciting by people arbitrarily placed into teams and running into other people), so I escaped to another room to hang out quietly. We went back to Nana’s house to sleep for the night. She spent quite some time explaining different rules and information she thought we’d need. This included the fact that we shouldn’t open a window because then someone could just come right into her house! Also, all the overflow drains in the house were taped-over. She doesn’t like bugs. She did show me photos of her husband, who I never met, and his medals from World War II. That was very cool! In the morning we got up at 6:15 and hit the road my 6:30. We were back early enough to have plenty of time for activities at home! This entry was posted in Journal, Photos and Screenshots on September 11, 2012 by TheUser. A couple weeks ago I saw the Aquabats at a free concert at the Orange County Great Park. It was outdoors, and while there was a large crowd in front, hardly anyone stood off to the side. That’s where I was. It let me get close without getting jostled, which meant I could actually film. No, I couldn’t really see Ricky Fitness, but I never really get any good shots of him. They actually performed two sets, which was pretty cool. They put a break in the middle, pointing out that parents with young children could take the kids home. I’m sure it was mostly the fact that they needed a break. The called a young fan, Joey, up to the stage. Joey was super fast even with his forearm crutches! The Aquabats performed “Martian Girl” with Jimmy on saxophone because his keyboard was having problems. It sounded great! Ricky Fitness sang “I Don’t Want to Lose Your Love Tonight” while the M.C. Bat Commander drummed. Sorry for singing a lot. I couldn’t help it. This entry was posted in Music, Videos and tagged the aquabats! on September 10, 2012 by TheUser. This entry was posted in Art, Sports and tagged fantasy football on September 2, 2012 by TheUser.